More staff have been put on the ground in Northland in an attempt to curb the highest cancer mortality rate of any region in New Zealand. Cancer Society Northland manager Jenni Moore said the region’s top cancers are breast, prostate, lower gastro intestinal, melanoma and lung cancer. In a bid to reduce the region’s cancer mortality rate, the Cancer Society has joined forces with four Māori health providers in Northland. 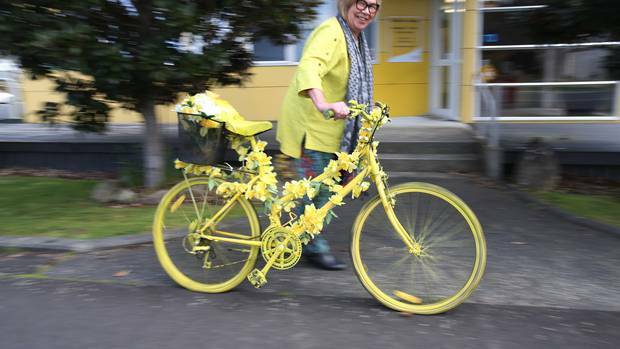 Cancer Society Northland cancer support nurse specialist Maggie Prentice with the daffodil bike ready for Daffodil Day. Three extra cancer support nurse specialists and two more community support workers have been employed on a part time basis, and are based out of Te Hiku Hauora, Ki A Ora Ngātiwai, Te Hau Ora O Ngāpuhi, and Te Hā Oranga O Ngāti Whātua. “It’s meaning we’re actually got more people out across Northland,” Moore said. The new services will be available to anyone in the Northland region who is living with a cancer diagnosis, whether they are Māori or non-Māori. The incidence rate of cancer in Northland is 348 per 100,000 of the population, compared with 338 per 100,000 of the population across New Zealand. The mortality rate from cancer in Northland is 137 per 100,000 of the population, compared to 120 per 100,000 of the population across the country. Cancer identification, treatment and care outcomes are worse for Māori and those living in largely rural areas, such as Northland. Maori make up 27.8 per cent of the Northland population and 13.5 per cent of the national population. Meanwhile 39 per cent of the Northland population is classified as most deprived while 19 per cent of the overall population is classified as most deprived. Moore said the nurses make phone calls and visits people who have cancer in their homes and give them information as well as allay fears and worries. She said people who have had cancer often have concerns about recurrence, or want to know what something means. The support workers set up support groups across Northland – there are around six at the moment, including a walking group. Moore said there is good evidence people benefit from talking with people who have experienced something similar. Moore said one of the biggest problems Northlanders face with getting to the their treatment is transport and accommodation. The Cancer Society run a volunteer driving service in Whangārei. Daffodil Day is on this Friday, and the money raised funds the support staff and services. It also helps fund Domain Lodge in Auckland, where cancer patients can stay while they are receiving treatment. The lodge is across the road from the hospital and provides information to patients and their support people. Moore said everyone has, or knows someone who has been affected by cancer and she encouraged them to donate this Daffodil Day. To find out more about Daffodil Day go to daffodilday.org.nz. Critically review the available evidence and you will conclude sunscreen reduces the risk of skin cancer, says Cancer Society CEO Mike Kernaghan - following Ian Wishart claims that sunscreen is ineffective.